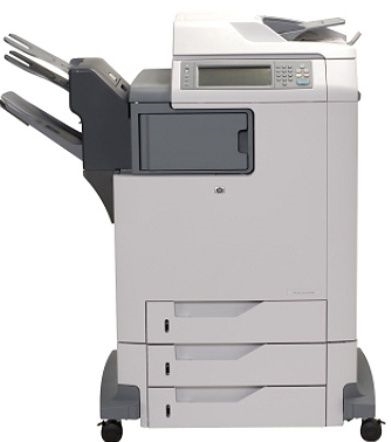 Office productivity will skyrocket with the addition of an HP Color LaserJet 4730x mfp. Use this Color Laser Printer, Copier, Scanner, and Fax and watch your efficiency go up and document costs go down. The network-ready 4730x mfp delivers high-quality documents at an amazing 30 ppm in black and white and color (print & copy). This powerful MFP features a 1,600 sheet input capacity, 50 sheet ADF, and HP Smart printing technology that allows the 4730x mfp to work for you which reduces down-time for paper and toner replacements. The 600 x 600 dpi and HP ColorSphere toner cartridges give you vivid results that are sure to impress clients and bosses alike. It's time to give your office a boost in productivity with the HP Color LaserJet 4730x mfp.